Ikeja City Mall, Alausa Ikeja, Lagos. 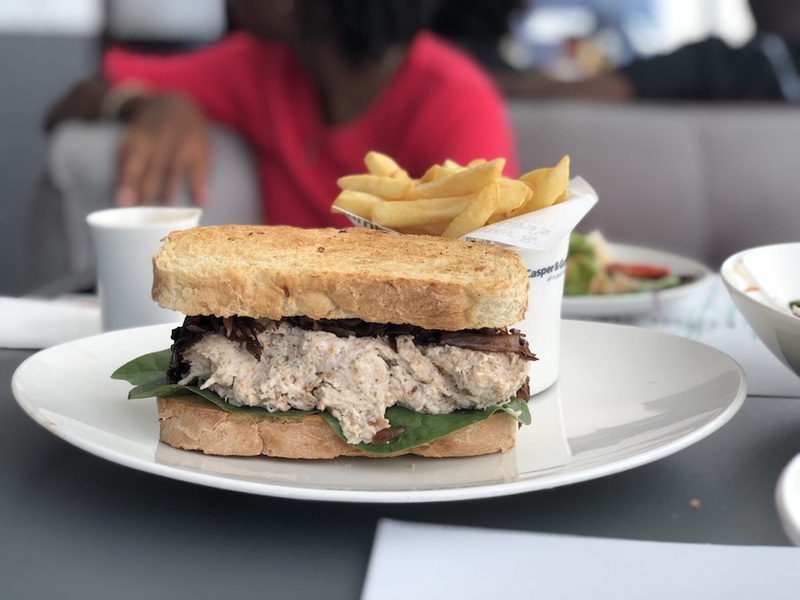 FOLLY: We headed to Ikeja City Mall to check out the new Krispy Kreme and a Mexican Caribbean restaurant that a follower had sent us a tip about. Krispy Kreme was delightful and we finally got to try the non-glaze varieties. The Mexican Carribean restaurant was a different story. NOSA: They had efo in a "showcase". FOLLY: If you've ever been to Panera in the US, you'd be familiar with their soup + 1/2 sandwich or salad deal. NOSA: Speaking of soup + sandwich combos, one summer in college, my flatmate and I ate tomato basil soup and a grilled cheese for dinner almost every night. Until the Nigerian girl I was dating at the time came into our lives and ruined everything by cooking rice all the time. 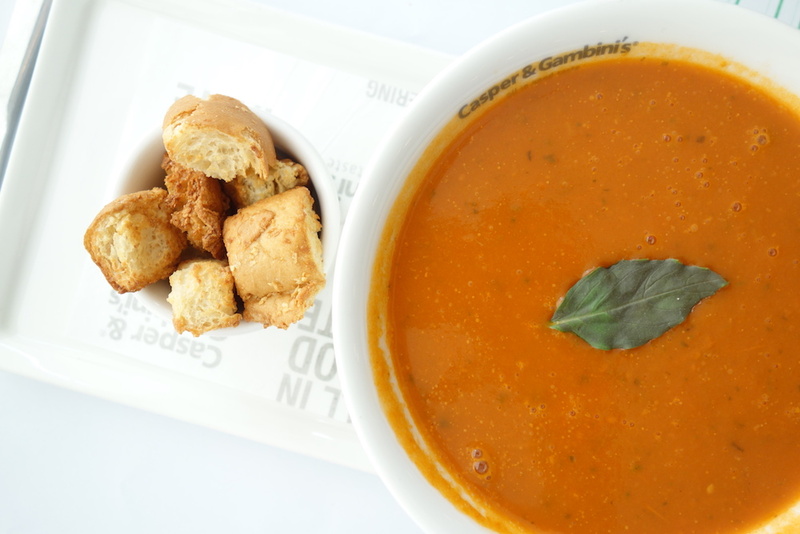 NOSA: The Tomato Basil Soup is one of my go-to orders at Casper & Gambini's. It's very "hearty" and if I'm being honest, it's worthy of an entire meal. I'll admit, though, that it's not for everyone. It's not as rich as typical Nigerian "soups" so you might need to manage expectations if it's your first experience. FOLLY: I saw the Asian Sesame Salad on the Casper & Gambini's Instagram page as a new item so naturally I wanted to try it. It looked exactly as it did on their Instagram so they weren't lying. My favorite components in the salad were the ginger, chicken, and the chin chin. NOSA: Was that chin chin? FOLLY: Eating this made me realize that I hate spinach in salads, I'm not sure the technical way to describe this but it's a bit harsh (to taste when it's raw) and just too green. I'd have preferred if the base was just plain ole lettuce or Arugula but that won't have made it typically Asian. NOSA: Arugula and kale are the ultimate salad greens for me. It's such a massive shame that salads in Lagos are so disappointing for the most part. Most restaurants put very little effort into their salads. C&G does a decent job, however. FOLLY: Now moving on to the sandwich. First of all, for those that are wondering that brown mess atop the chicken salad filling is caramelized onions. Yes, they made the sandwich so unattractive but they added a much needed sweetness to it. FOLLY: I had the slide that big leaf out of the way cause the taste was too harsh (again). The bread was also over toasted but that was not a big deal. NOSA: It's not a big deal if having the roof of your mouth ripped apart is fine. It's looks great in the picture, but it wasn't the most ideal. ALSO, I expected the chicken salad to have a bit of a sweet kick, but that never came. The onions gave it their best shot, but it didn't quite satisfy my expectations. FOLLY: I feel like a lot of Lagosians don't know this but Casper & Gambini's has a nice range of sandwiches - get hip. FOLLY: I don't go to Casper & Gambini's a lot but I like that it's consistent. I recommend it a lot for work functions because the price point isn't too steep and everyone is guaranteed to find something they'd like on the menu. NOSA: Would definitely visit again. C&G is what Cactus used to be. That consistency is unreal.